The Afghan Hound is a gentle, friendly dog breed that makes an excellent family pet. With a low dominance level, this breed is very sweet and affectionate making it a wonderful companion to older, considerate children. This breed is reserved and suspicious of strangers, but never hostile. The Afghan Hound brings a loving nature, lively and active personality together with its exquisite beauty and style. The Afghan Hound breed is an average shedder and its long, thick coat demands a great deal of grooming. Weekly baths and brushings result in a less matted coat and are a must if showing your Afghan Hound. Refrain from in-between bath brushing. Brushing a dry coat will result in damage and cause it to be more easily matted. To keep your Afghan Hound’s coat shiny and long, only brush it when wet. This dog breed is healthy and known to have long lives. The Afghan Hound has a low pain tolerance, causing suffering even with minor injuries. Afghan Hounds love to be outdoors. Originally, this breed was used as a hunter of wild goats, deer, wolves and even snow leopards, as well as a watchdog and herder. These dogs need plenty of running opportunities, preferably off the leash, and require lots of regular exercise. The Afghan Hound is an extremely fast and agile runner who makes an excellent sighthound. This dog breed is not highly recommended for apartment living. 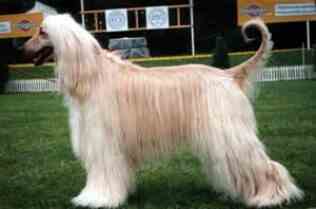 The Afghan Hound requires firm yet gentle obedience training and can sometimes be difficult to housebreak.